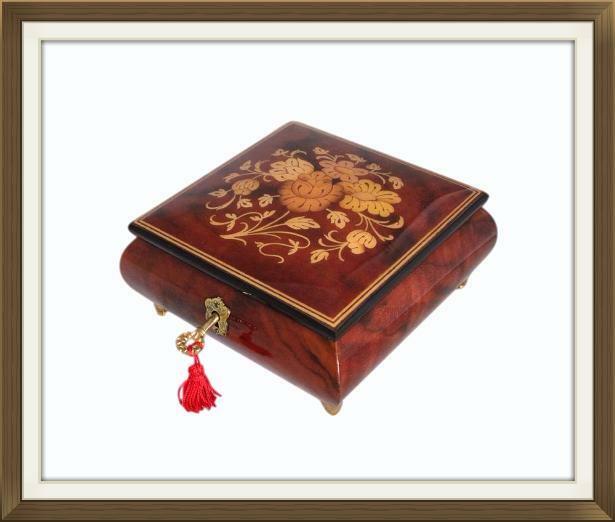 This is a beautiful small musical jewellery box, made in Italy and dating to the 1970s/80s. The exterior has a lovely Mahogany veneer which has been polished to a beautiful high gloss finish. The lid has decorative floral inlay which is made up of Satinwood and other various woods, and this is surrounded by a frame of Satinwood stringing. 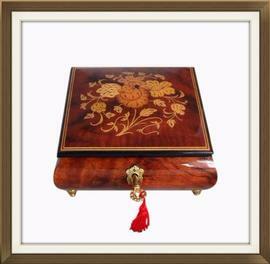 There is a decorative gold metal escutcheon to the lock and a gold metal piano hinge to the lid. The lid has a subtle pyramid shape with softened edges. It is not flat. 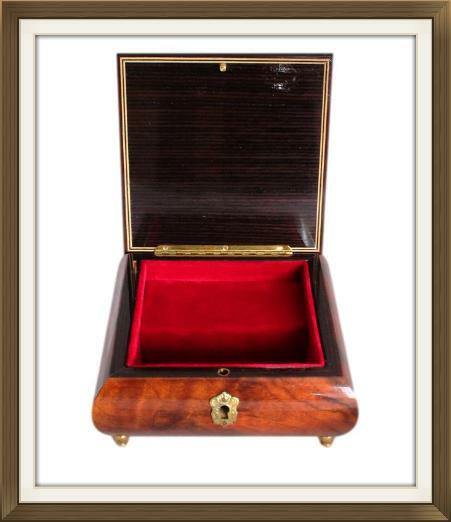 The bottom of the box has a Satinwood veneer and small gold metal bun feet. The winding key to the musical movement is also on the bottom. The box is complete with its original key and it locks securely. The lock is a little stiff and does not require a full turn to fully lock. 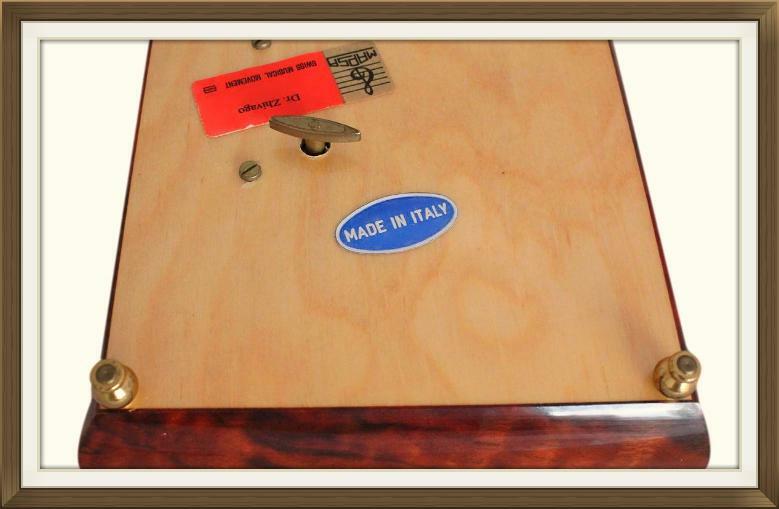 The bottom of the box has retained its original MADE IN ITALY and musical movement labels. The interior has a single small storage compartment, plus further storage space on the ledge behind it. There is also a lovely ring storage section, set at an angle, in front of the compartment. The ledge available for storage behind the compartment, is the lid of the casing to the musical movement. The interior is lined with plush red velvet. 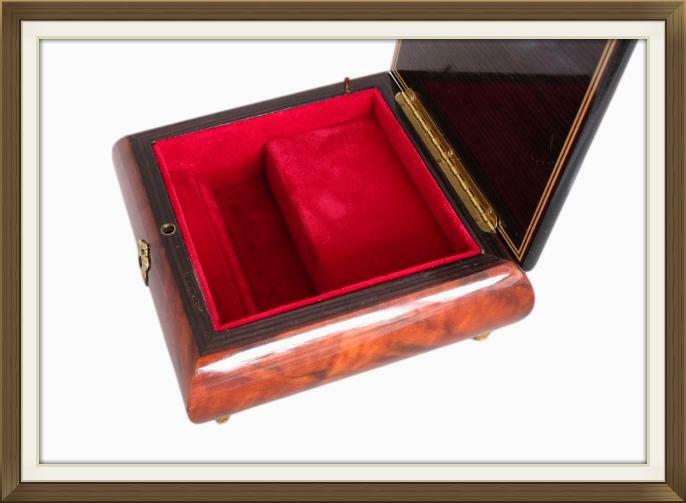 The inside of the lid, and the edges around the compartment, are veneered with beautiful Macassar Ebony. 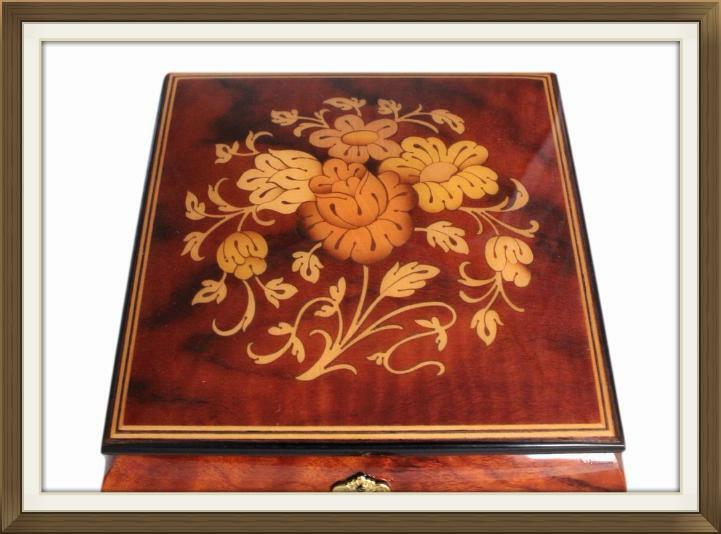 There is also a frame of Satinwood stringing to the inside of the lid, to match the exterior. The movement plays the beautiful 'Lara's Theme' from the epic 1960s romantic drama film, Dr Zhivago. It is a quality Mapsa Swiss musical movement, and it winds up via the key on the bottom of the box. 5 turns of the key are sufficient to play the tune in full. The movement has been tested and is currently in good working order. The tune plays at the correct speed and stops as it should, when the lid is closed or when the movement has fully unwound. Care should be taken not to over wind the movement. Over winding with the key can result in the movement malfunctioning. We are not responsible for musical movements or locks that suddenly malfunction after purchase, from further age and use. 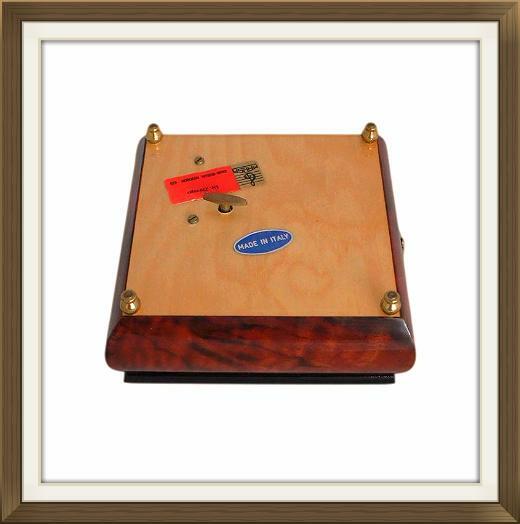 Please check that the tune is playing correctly and that the box is locking properly, as soon as you receive the box. Thank you. This beautiful box is in lovely condition despite its 30/40 years of age. The finish to the exterior is still excellent with no loss of veneer or inlay. The interior velvet linings are also in excellent condition with no splits, wear, or fraying. There are minor manufacturing flaws to the Macassar Ebony veneer of the interior. There are small indentations to this veneer, to the inside of the lid (top right hand side), and to the edge (right hand side) in front of the compartment. These little flaws are not overly obvious and they do not detract from the beautiful overall appearance of the box. Being on the inside, you cannot see them until the lid is raised. 10.5 by 3.0cm with a 4.0cm depth. Holds 4-5 rings depending on their sizes. Please note that this will not hold thick or broad rings such as wedding bands.